IMAGINE STANDING UNDER A VAST, SCINTILLATING AURORA BOREALIS, and seeing it change colors as you changed your thoughts. This exact situation led Russian medical doctor Alexander V. Trofimov into his groundbreaking research on human consciousness, in collaboration with Vlail P. Kaznacheev, and following in the footsteps of the great 20th century physicist Nikolai Kozyrev. Within this “flow of time,” the past, present, and future all exist at the same time, and in every place. This discovery sets the stage for all psychic phenomena to be scientifically explainable. Trofimov and Kaznacheev have, for the past thirty years, been experimentally developing the practical explanations, and have made some surprising discoveries. 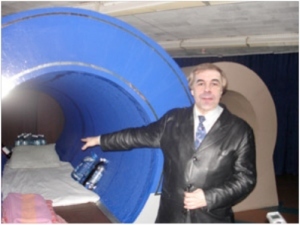 When I visited Trofimov’s laboratories at the International Scientific Research Institute for Cosmic Anthropo-Ecology in Novosibirsk, where he is general director, he enthusiastically showed us his two main experimental apparati — two hollow, metal, person-sized tubes, equipped with mattresses and drinking water. The first, dubbed “Kozyrev’s Mirrors,” reflects thought energy (which exists within the “flow of time”) back to the thinker. This apparatus, invented by Kozyrev, gives access to intensified consciousness and altered states, including non-linear time — similar to a deep meditational state. Trofimov’s work has consisted of “remote viewing” experiments across both distance and time. They discovered that results are more positive when the “sender” is in the far north, where the electromagnetic field is less powerful. So they invented a second apparatus that shields an experimental subject from the local electromagnetic field. Within this apparatus, their subjects can reliably access all place and time — past, present, and future — instantaneously. 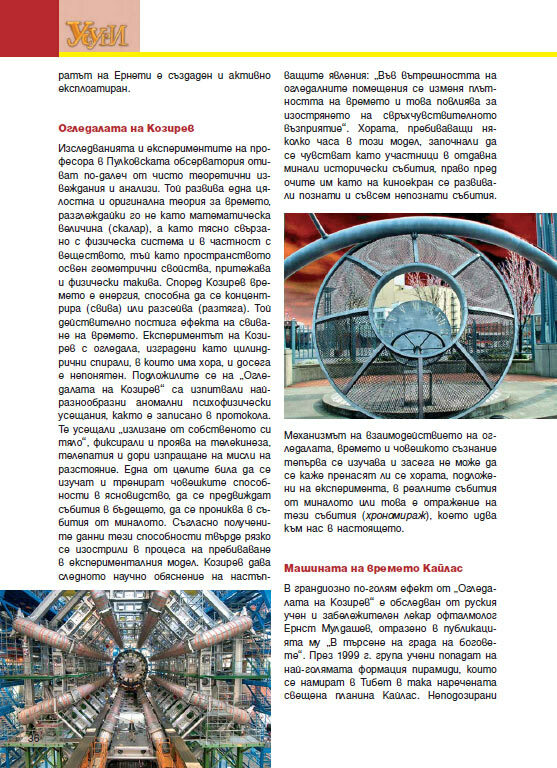 Construction specifications for these apparati are published in Russian scientific literature. 4) that once a person has accessed these states, his or her consciousness remains so enhanced. The implication is that the global electromagnetic soup of cell phones, radio, television and electric appliances actually impedes our innate communication abilities. The further implication is that expanded human consciousness is mechanically producible now, which raises the vast ethical question of how these apparati can be most beneficially used. Carol: Alexander, why did you begin doing research in this field? Trofimov: I very clearly remember the moment. It was March, 1975. After my post-graduate education, my first expedition as junior scientific researcher was to Dixon — a small village in the far north, which is located above 73 degrees latitude. It was to study adaptation of human organism to the conditions of the far north — a great experiment of U.S.S.R. Academy of Sciences. I worked with Kaznacheev, who was the creator of the civilian department of this Academy. I began my investigation as a cardiologist, studying the reaction of the cardiovascular system and the importance of different magnetic conditions. I stepped outside our hospital to see the aurora borealis, which was like a cone over our building. This first impression was wonderful! I felt that we were interacting, that what I thought was changing the colors of the aurora borealis. I didn’t know whether it was my consciousness or cosmic consciousness. Only later did we learn about cosmic consciousness. But it was a beginning for me. I continued my investigation as a doctor, and from approximately 1990, with Academician Kaznacheev, we began new cycle of work — the study of cosmic consciousness. Let me show you Kozyrev’s Mirrors. This apparatus is the grandfather of Kozyrev’s Mirrors — the first generation. Now we have seven generations. Carol: But why is this called a mirror? Where is the mirror? Trofimov: We use the law of optical reflection — which also applies to streams other than light. When the surface is curved, according to this law, the energy is focused. 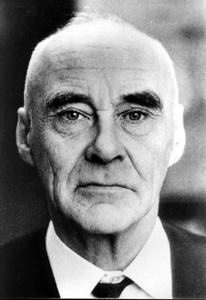 Kozyrev was also an astronomer. He created a small mirror to put inside a telescope, which he focused on one of the stars. And he programmed it for three times: one year in the past, the present, and one year in the future. Carol: And how did he program that? Trofimov: He simply calculated, using some mathematical methods. He had the know-how to calculate where it was, where it should be, and where it is — its projected location. So he realized that the star is present everywhere — in the past, present, and future. Carol: But that is common knowledge. What was the discovery? Trofimov: We wanted to prove it in a scientific way. Kozyrev proved it in astronomical terms. Our task was to prove it in biological terms. So the legacy of Kozyrev was that, if people could create such kinds of apparatus that are capable of creating density of the energy of time, from this point they could have the opportunity to visit any place in the universe. We created such an apparatus, and called it Kozyrev’s Mirrors. It takes the energy not out of the stars, but out of the human being — being a star. (Carbonaceous life forms, such as those on Earth, are one stage of a star’s evolution.) And these streams coming out of human beings, they are not allowed to go everywhere in the space, but they are concentrated here, creating this density of the streams of time and energy. But a human being should be specially prepared, and when he spends some time inside, he finds himself in a particular state of mind. He can travel to any part of the planet. And there is a special “ray” enabling him to be in this or that part of the planet. We used this kind of apparatus for our experiment for distant communication with Dixon. Basically, there was a person inside the mirrors who was given symbols that he was supposed to project, and there were people all around the world who were supposed to receive. Carol: Were they also in mirrors? Trofimov: No, they were in an ordinary life situation, but they knew the time. There were three special sessions for investigating the role of television and radio. The person inside the mirrors projected the symbols and they made a television recording of it. They showed these recording to people from Dixon. They also made television recordings of three sessions in which a person projected symbols, but was not inside the mirrors. And almost 80% of the people who took part in this experiment received the information. The results using the television recording were even better than straight from the mirrors. Another interesting detail: the people who were receiving the information were asked to simply switch on their television, without even sound or images, but just power, and it gave the opportunity to receive this information more effectively. So this space around the planet, and television and radio space interrelate. And they approached the world with special precautions so that people would know the interrelationship of space and radio waves. It was very important. So, fifteen years ago, they made this research and realized these consequences. Carol: Well, the whole planet is an electronic soup, with radio waves on all frequencies. Trofimov: Yes, exactly. So, to the next room. This is a “cosmobiotron” clinical device. There are two here — the only ones in the whole world. Inside this apparatus, the electromagnetic field is reduced almost to nothing, which allows us to go anywhere in space. Just to be free, out of the magnetic field of the earth. Carol: How does it do that? Trofimov: Inside this shell are several layers of a special steel called “permalloy” that has magnetic “receiving qualities,” that is sensitive to magnetism. 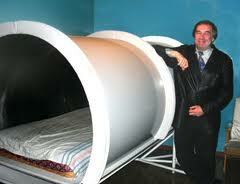 Inside the tube, the magnetic field is diminished 600 times. Currently, the Earth’s magnetic field has 49,000 nano-Teslas. It has been decreasing by about 50-70 nano-Teslas per year. By the end of the millennium, we’ll have only 100-200 nano-Teslas. So, this apparatus allows us to emulate the situation that we will have 1000 years in our future. [He sat down on the open end of the tube]. Where I’m sitting now, the magnetic field is how it will be on Earth in 100 years. As I move further into the apparatus, the magnetic field is decreased, as it will be on Earth further into the future. We measure the results every 15 centimeters, which is equivalent to 100 years. In a thousand years, we will be somewhere in the middle of this apparatus. This apparatus is the most important research instrument for assessment of the evolutionary consequences of the fluctuation of Earth’s magnetic field. Carol: What is the result of that diminished magnetic field? Trofimov: As the force of the magnetic field is decreased, the sun’s energies will penetrate more. Carol: So the magnetic field protects us from the solar rays? Trofimov: Yes, and also cosmic rays — galactic protons, for example. The less protection there is, the more particles can reach us. Carol: Is the ozone layer a different mechanism? Trofimov: Somewhat different. The ozone layer filters only the ultraviolet part of the spectrum. So we have a profound opportunity to really emulate what will happen with any living creature or human being, century by century — how we will co-exist with these energies from space. What will happen? Either our mind reserves or extra abilities will open, or on the contrary they will be limited, and some catastrophe will happen. So basically, this is a like a theatrical stage, where we can see how the fate of human life will play in a thousand years. We have been working more than 15 years, so we do have results. Part of our results have been published, and we are preparing to publish more. Now I will say something important. As we investigate brain activity — either with an electro-encephalogram, or by assessing brain functions like intellect level, memory, and other functions, we realize that we currently use only 5% of the capacity of our brains throughout our whole lives. And then, after we spend some time inside the apparatus — in a space without magnetism — we repeat the same tests, and we see a drastically different picture. We see that our mind’s additional reserves and abilities are activated. We see an increase in memory capacity, increased IQ, and changing zones of electric activity of the brain. Carol: Is this because of the reduction in magnetic field? Trofimov: When the magnetic field is decreased, we see an increasing ability to use the reserves and capacity of the human brain, and that’s good. But there is still a question of whether it is good for everyone. How quickly should these reserves be opened in real life, and for what would these resources be used. Why should we access these resources? What is the practical use of this opportunity? Just opening the resources is not a panacea. We need a scientifically rigorous forecasting model — not a purely theoretical one — about what will happen with us, and how this knowledge can be used right now to educate. For example, how long should a person be inside to increase his memory capacity without waiting a hundred years. We are now doing practical research on how to make use of this phenomenon. There’s another important point. When a person is inside, his brain function is in direct correlational dependency not only with solar energies, but with galactic rays. So we thereby open a request for information from the galaxy. We believe that this is the mechanism by which cosmic human consciousness is currently being opened, with the decreasing electromagnetic field. This shift is opening people’s “cosmophile” properties — properties that we are lacking right now in this “cosmophobe” world. But we cannot bring the whole of humanity onto this cosmophilic life-raft, because we are only in the experimental scientific stage that allows us to make a forecast and back it up experimentally. According to the Russian writer and philosopher Gumilev, balance or imbalance in the number of cosmophobes or cosmophiles in any society or ethnic group defines the fate of this society or ethnic group. So what can we do? For the survival of our civilization, we have to foster the cosmophiles. And for this, we need to open these resources. While we can give people this possibility, we cannot order or force them to be cosmophiles. We need a well-coordinated system to guide people to this source. Alexander V. Trofimov, MD, is General Director of the International Scientific Research Institute for Cosmic Anthropo-Ecology, which was founded in 1994 for scientific investigation, and is located in Academic City, Novosibirsk, Russia. Introduction: ISRICA, Russian Cosmism and the Kozyrev Mirrors. ISRICA – Institute for Scientific Research in Cosmic Anthropoecology – is an organization within the Russian Academy of Sciences, Novosibirsk, Siberia, with which the Research and Development Center of the Foundation for the Law of Time has entered into a collaborative relationship. The work at ISRICA is largely based on original research of N. A. Kozyrev, and to a lesser degree, V. I. Vernadsky, as elaborated upon by V.Kaznacheev and Alexander Trofimov. Kozyrev’s work in particular has been of interest to the Foundation’s Research and Development Center because of his extensive investigations into the nature of time. Through his astronomical and mathematical studies, Kozyrev concluded that time is actually a kind of information frequency beam transmitted from stellar cores (which his studies showed to be not hot and dense but relatively cool and more hollow, though quite complex in nature). Based upon Kozyrev’s findings, the second axiom of the Law of Time states: The velocity of time is instantaneously infinite. It is this principle of time that accounts for the transmission of telepathy. Several different streams of thought and research have arisen from Kozyrev’s profound and often controversial work. The ISRICA represents the stream based upon and often utilizing the “Kozyrev mirrors,” and of which V. Kaznacheev has been the principle researcher. The Kozyrev mirrors are installed in such a way as to create a closed space in which there is a weakening of the magnetic field of the Earth, and which thereby provides more human access to solar and galactic information. Through numerous experiments using the mirrors with this intention, the ISRICA has focused studies in a number of areas, including human psychophysiology, pathology of disease and health, and the evolvement of telepathic fields and remote sensing. In 1990-91, a precursor of the rainbow bridge experiment was conducted entitled, “The ‘Aurora Borealis’ Global experiment on Investigation of Distant-Informational Interactions in the Noosphere and their Role in the Planet-Biospheric Homeostasis of the Earth”. The conclusions the ISRICA scientists have drawn from the experiments with the Kozyrev Mirrors are often startling to the Western mind, and can best be understood within the context of the Russian school of thought known as Cosmism. This point of view plants the notions of mind, thought, intellect and science in the cosmic realm as functions of self-existing thinking layers dispersed throughout the universe and which are adapted by temporal conditions to the evolving states of planetary biospheres or planetary/stellar noospheres. “Obviously, it is a great research step, having a possibility of combination of physical methods with psychophysiological human intellect possibilities and its field of ether-torsion properties. Maybe this technology is proposed to study biospheric complexes, considered as basic solar units, as the state of the nearest and least removed cosmic space. The work of Alexander V. Trofimov and Vlail P. Kaznacheev along with those working in related areas may have some of the best science to offer this century! The link with quantum mechanics may very well, enhance our understanding in conjunction with the quantum computer, in a previous unprecedented way! First I have two questions. First question: Have you ever gotten drunk enough to find the room spinning on the head of a pin? If not, go back to Church. If so, then please note the pin’s loci – directly above and between the eyes. Right over the “Third Eye” (pineal gland)! Next question: Have you ever seen spots and dots of light swimming around your head like dust-motes? This is what cartoons lampoon when the character gets something heavey dropped on their head and little stars or birds dance around the skull. If you have seen both of these phenomenon, congrats – you have seen the Jna Chakra. Jna, sanskrit for ‘to see, to percieve, to know’. Try searching for the sparks by Prana Meditation in sunlight, breathing slowly in through the nose, hold, then slowly out through the mouth. When you see the sparks, notice they eventually will start spinning down into a funnel shaped object, funneling directly down into that pin-loci of the Jna Chakra. Congrats. You now have direct, emperical evidence for a magnetic bubble around your body, a bubble you can activate like Kozyrev’s Mirrors to create your very own personal Electromagnetic Null Zone. The more you make it spin, the more pronounced the energies become. The Buddhists called this the “Sphere of Heat”, saying it surrounded all of the Buddhas and Boddhisattvas whenever they performed miracles like levitating or time-travel or travel through space to different kingdoms or planets. The Buddhists also call this the “Boddhisattva Vehicle” or chariot and the Jews called it the “Merkaba Chariot”. Наладить массовое производство недорогих камер- цилиндров из строительной фольги с повышенной отражательной способностью. Но лучше лежать в камере, которая внутри большой пирамиды из земли или сена. И чтобы рядом не было техногенной среды. На вершинах гор – максимум эффекта! The Electric (and certainly magnetic) Universe movement is gaining momentum and provides us with relatively simple understandable whys and wherefores of our galactic environment. I see the electricity of the cosmos not so much as electricity from the power company more as power from the telephone company, powerful current, but also containing encoded wisdom. The Electric Universe movement is gaining momentum and provides us with relatively simple understandable whys and wherefores of our galactic environment. I see the electricity of the cosmos not so much as electricity from the power company more as power from the telephone company, powerful current, but also containing encoded wisdom. What a brilliantly refreshing article. I have been doing healing work (distance) for years with Epic Success all founded on a vast personal history of supernatural phenomenon. Now, I have reached yet another dimension of understanding and this excites me greatly. I am more conscious now. Thank you for this research!